[miau] When something is huge in popular media, like with movies or music, and then becomes a game, you better believe that millions of people are going to start playing it. This is the case with console games, PC Flash-based games, and even online video slot games, like the Playtech release, Thor. 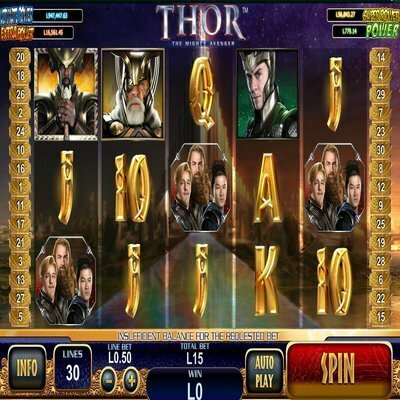 Thor: The Mighty Avenger, is one of Playtech’s many releases that deals with popular culture. In this particular game, the theme is evident. What’s also evident is that the company put a lot of thought into this game before releasing it to the public. It looks great, plays very smoothly, and it pays off not one but three different progressive jackpots. The first thing anyone is going to notice about Thor is that the God of Thunder is front and center on this game. Although part of Playtech’s stable, the game is actually powered by Cryptologic, which means the designers have had a lot of practice desiging these types of games. It really shows through in the theme. This is the movie version of Thor, not like the comic version. So all the the main characters you love, including Thor’s hammer, are on full display here. There are competing Thor games on the market today, so understand that the one we’re reviewing here is the movie version. You will instantly be able to tell the difference, when you see the characters from the movies acting as the game’s theme. This particular machine is a 5-reel, 30-payline slot game that has a range of options available. There are many different bonus features of this game, including the Thunderstorm Respin, the Lightning Free Spin, the Rainbow Bridge Feature, which triggers a new game and also free spins, and other free spins game features. You cannot speak about any betting options with Thor and not speak about the progressive jackpots. Although they are very rare to actually win, the progressives are what keep people coming back time and again. And since progressive players don’t typically bet more than low-roller stakes, Thor works out perfectly. You can bet as little as 0.01, if you’re only in it to try to win the big one. 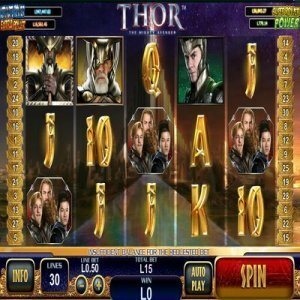 Or, you can up the ante and possibly match Thor on the reels and win up to 5000x your bet. Although one might think games like these are popular, it’s actually rare for a movie to become a game and not reinvent itself. Most of the Thor games you’ll find are based on the comics, not on the hit movies, and the same goes for games like Spider Man and Blade. The theme of this game is great, there are many different betting options, and the fact it’s a progressive machine is also a big plus.